The White House had stern words for Turkey’s ruling Justice and Development Party (AKP) this week following the dramatic crackdown on a media conglomerate that temporarily shut down two newspapers and two television stations just days before the November 1 election. President Recep Tayyip Erdogan’s AKP regained its majority in Parliament in Sunday’s election, following significant losses in a July election that forced the AKP to either form a coalition government with another party or reschedule elections and bet on Turkish voters strengthening their numbers in the legislature. After a failed attempt to form a coalition government with the Nationalist Movement Party (MHP), the AKP announced Turks would return to the polls in November. In the days preceding the election, Turkish police raided the offices of Kozi-Ipek, a media conglomerate that is home to the newspapers Bugün and Millet and the TV networks Bugün TV and Kanaltürk. Satellite footage, as well as live broadcasting from inside the Bugün control room, showed police violently attempting to subdue and arrest journalists in a forced takeover of the company. Outside the office, journalists and supporters faced tear gas and water cannons, while police inside struggled to turn the television broadcasts off. Kozi-Ipek has ties to controversial U.S.-based cleric Fethullah Gulen, who President Erdogan considers an enemy of the state. The government has since appointed new trustees in the corporation who have begun to fire the voices most critical of President Erdogan within the company. On Tuesday, Turkish media reported that at least 58 journalists working at Kozi-Ipek had been fired following the raid. 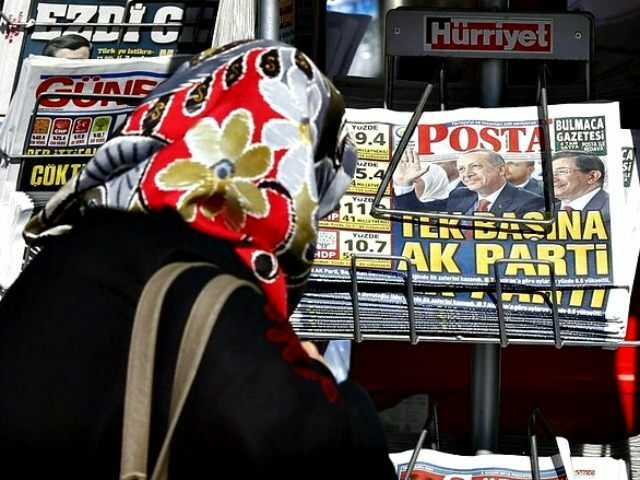 While the Kozi-Ipek rapidly became one of the biggest news stories nationwide, particularly for those who already perceived the Erdogan government has hostile to critical voices, crackdowns on media have continued following the elections. On Tuesday, a court in Istanbul confiscated the latest issue of the magazine Nokta for allegedly “inciting crime.” The magazine’s cover displayed a photo of Erdogan alongside the headline “Nov. 2, Monday: The beginning of Turkey’s civil war.” Nokta has been previously cited for “insulting the president,” a crime in Turkey, following the publication of a cartoon of Erdogan taking a selfie next to the coffin of a dead soldier. The United States has concerns beyond Turkey’s treatment of its domestic media, however. The Turkish government’s military actions in Syria could potentially threaten American allies, particularly the Kurdish People’s Protection Units (YPG), who the Turkish government has threatened to attack recently. The YPG claims Turkish airstrikes have already begun over there positions against the Islamic State near the border town of Kobani. Erdogan’s government is adamantly opposed to the presence of a Kurdish state on its borders and considers the YPG a terrorist group, along with the Kurdistan Workers’ Party (PKK), which works closely with the YPG. The American government has designated the PKK a terrorist group, but not the YPG, as it is the military of the government of Syrian Kurdistan. Erdogan threatened to attack the YPG in a speech last week if they crossed west of the Euphrates River. “This was a warning. ‘Pull yourself together. If you try to do this elsewhere–Turkey doesn’t need permission from anyone–we will do what is necessary,’” he said. Erdogan has also accused the group of “ethnic cleansing” against Arabs. Turkey continued airstrikes against the PKK on Tuesday in Kurdish-held regions of Iraq and Syria. The United States has used YPG intelligence to attack Islamic State positions in Syria, and some Kurdish troops have claimed to receive an airdrop of American weapons. The Pentagon claimed these weapons were intended for Arab Syrian rebels and arrived at their intended destination, though Syrian Arab forces have also complained that the Kurds took their weapons.